James Garfield confirmed his liking for Newbury with a second Group success at the Berkshire track in the Al Basti Equiworld Supporting Greatwood Greenham Stakes. 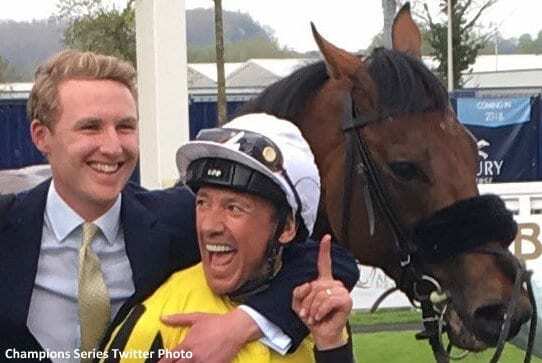 Winner of the Mill Reef Stakes last September, the George Scott-trained colt showed he had trained on by producing a battling display to gain a narrow verdict in the hands of Frankie Dettori. Hey Gaman made the running and stuck on gamely as his rivals closed in, with James Garfield (3-1) challenging strongly on the stands side to collect the Classic trial by three-quarters of a length. Expert Eye, the 7-4 favourite, took second place by a short head from Hey Gaman. Trainer George Scott said: “Anyone looking at him in the paddock could see he was fit and ready today and I liked the way he finished off his race so well. “His attitude, his will to win and his toughness make him what he is and he'll be my first Classic runner in the Guineas in two weeks. It's just a dream for me and I feel so very lucky. “We were going away from the others at the line and Frankie was delighted. He's so cool in these situations while I'm there shaking like a tree. James Garfield was cut to 16-1 from 33-1 for the Qipco 2000 Guineas with Paddy Power. He was halved in price from 40-1 to 20s with RaceBets, who pushed out Expert Eye to 12-1 from 8-1. Sir Michael Stoute, trainer of Expert Eye, felt the ground may not have been ideal. This entry was posted in Racing and tagged 2000 Guineas, frankie dettori, george scott, greenham stakes, james garfield, mill reef stakes, Newbury by British Horseracing Authority. Bookmark the permalink.